Origin and Habitat: Island of Socotra (just off of the northeast shoulder of Africa in the Indian Ocean - Yemen), Ethiopia. Somalia, and the desert regions of Kenya. Altitude range 120–1500 metres above sea level. 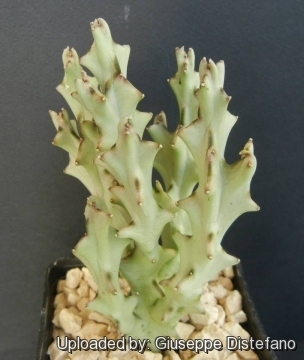 Description: Caralluma socotrana is one of the most bizarre species in the genus with symmetrically jointed stems that make it look like a pale green coral. But its peculiarly are its unique, almost glistening, vermilion flowers. 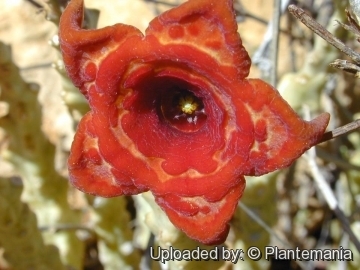 It is one of the showiest of all the succulent Asclepiadaceae. 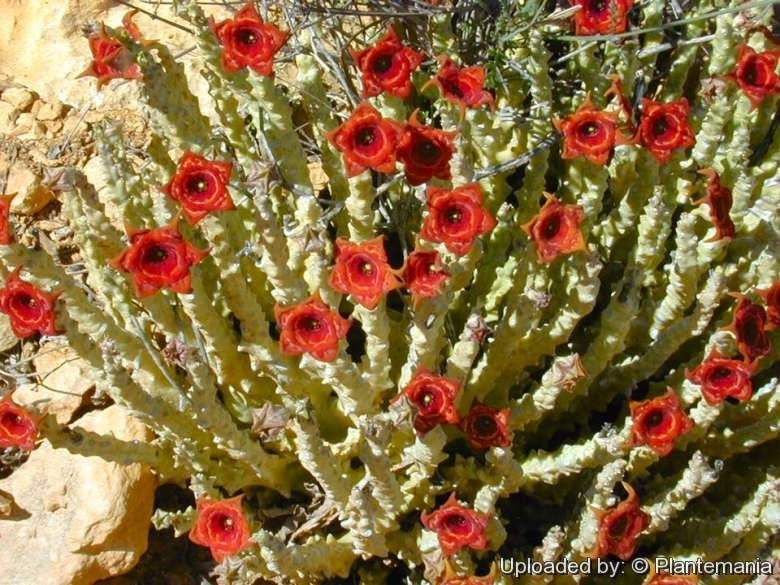 It is closely related to Caralluma cicatricosa. Stems: Up to 15 cm tall 0.8-1 cm in diameter (lateral stems apically 3-5 mm in diameter) pale green to bluish-green with brownish- or blackish-green tubercle, with pungent odour, edges blunt. 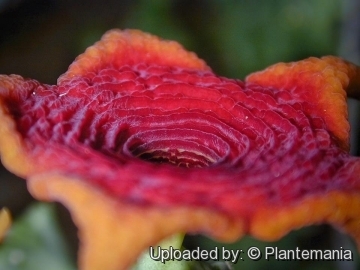 Tubercles oblong-conical and stems undulate in outline. Leaves: Rudimental, small, deltoid, compressed, cartilaginous, apically brown, and papillate. Inflorescence: 1-flowered, subterminally from axils, or few-flowered pseudo-umbels. 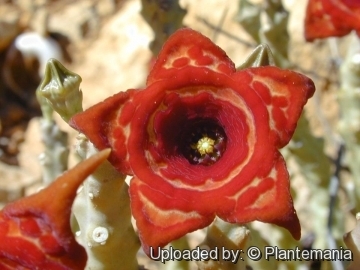 Flowers: Star-shaped, velvety bright red to orange. Pedicels 1-3 mm long (5-7 mm at Fr ripening). Sepals 2-2.5 mm, alternating with small glands. Corolla about 20-30 mm wide; tube 6-20 mm long 9-11 mm in diameter campanulate, yellow with red or brownish dots, limb vivid red or brownish-red with concentric, darker ridges. Corolla-lobes approx. 5 x 5 mm, broadly triangular or ovate-triangular, shortly acuminate, horizontally spreading. margins strongly recurved with marked sinuses between them, uniformly dark red. Corona 3.5–4.5 mm high, dark purple-red, the outer lobes so deeply divided that they look like basal appendages of the inner lobes, apical margins densely white-ciliate. Anthers 0.8 x 0.5 mm. Pollinia 0.35 x 0.3 mm roundish-ovate, flat, translator wings 0.1 mm. The flowers stink of rotten flesh to attract pollinators. Blooming season: The Caralluma socotrana flowers in the Autumn. The flowers are short lived lasting one to several days at most. ***Fruits:** Pale green-yellow spotted with purple, approx. 10 cm long and 0.5 -0.8 cm in diameter and containing papery seeds. Cultivation and Propagation: Caralluma socotrana is a particularly difficult plant to keep because of its very specific growing needs with much light and relatively high (above 15°C) winter temperatures. This is primarily a result of it being somewhat fast growing and short-lived by nature. It’s very susceptible to rot in combination with low temperatures, but given the right growing conditions it is an easy blooming plant. The goal with this plant is to grow it as fast as possible in the heat and full sun of summer (lots of water!) and hope for flowers the first or second season and then try to keep it alive during winter with lighter, but regular watering. Pieces of stems may be used to start new plants, so it is worth a try!